The Dirty Truth On How To Get Ripped! Summer is HERE, and the time has come to kick back and relax under the sun. It's time for the beach days, barbecues, pool parties, and for any serious gym goer these activities also mean one thing: it's time for the shirts to come off and to showcase that rock-solid physique they've been working on all year. No one wants to be walking around with a soft, smooth and flabby body, and for the next month or two, all of those serious lifters will be shifting into get ripped mode baby! For many of us we want to know how do they usually go about this? ANSWER: They lighten up the weights and perform higher reps. This has always been a widely accepted method of cutting down and if you ask most trainers in the gym they will tell you that heavy weights bulk up the muscle and lighter weights define the muscles. It couldn't be farther from the truth. In fact, there is no logical basis for this way of training whatsoever, and whoever dreamt up this downright ridiculous way of thinking has caused the vast majority of lifters to waste their time and impede their progress in the gym. Training with weights builds muscle mass, end of story! Let go of the traditional method of moderate intensity cardio in 30-45 minute durations. If you want to maximize your body fat burning capacity and also minimize the muscle loss that inevitably accompanies a fat burning cycle, focus on shorter cardio workouts performed at a high level of intensity. These types of workouts will shoot your resting metabolism through the roof and will allow you to burn maximum amounts of fat even when you are at rest. I recommend 3-5 high intensity cardio sessions per week, spaced at least 8 hours away from your weight workouts. That's all there is to it, folks. Take the notion of light weight and higher reps and throw it right out the window, down the street and around the corner. Following this misguided method will only cause you to lose muscle mass and strength, and will not assist you in burning fat or defining your physique. I'll see you at the beach! It is now known that stress can actually cause you to stop losing weight especially around your middle section. Stress can cause your body to secrete high levels of a hormone known as cortisol into your bloodstream, because of your body's "flight or fight" response to stress. Stress can be either psychological (mental and emotional) or physical. High levels of cortisol may also decrease your bone density, leading to osteoporosis and loss of muscle tissue, which will also slow down your metabolic rate, and increase your blood pressure along with giving you other problems. Each of us reacts differently to stress; some of us will produce more cortisol, due to a particular stress while others will produce less. It has been found that those of you that produce more cortisol will actually eat more food as well, in particular carbohydrates. To combat producing too much cortisol, learn ways to relax and change your lifestyle. A good way to do this is through relaxation, which can be achieved in a number of ways either by exercising, mediation, yoga or breathing. One of the easiest and simplest ways is breathing. 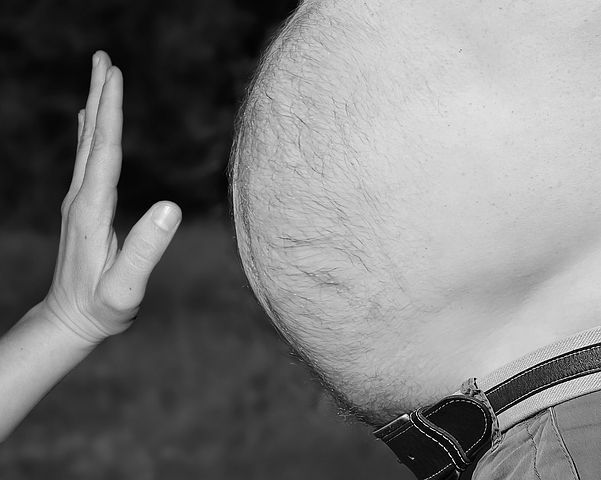 This is done by gently breathing in through the nose, while expanding your abdomen and then gently expelling the air through your nose, while pulling in your abdomen at the same time. After several breaths in and out you should start to feel yourself relax. You need to practice doing this exercise a few minutes a day to start with, while building up to five minutes in the end. You can also practice this when you are feeling stressed or when things are getting the best of you. Just a few minutes can slow your body down and help it to feel relax. Life style changes can be like changing your eating habits for a healthier diet, getting enough sleep, or even organizing your time more efficiently so that you do not feel so stressed. Also looking after your body will help your body to cope with stresses that you come across during your day. So if you are exercising frequently and eating properly but still not losing any weight especially from around the middle then maybe you are suffering from high levels of cortisol caused by stress. If this is the case, try looking at ways to solve the problem and hopefully you will see a difference in your weight and around your middle.